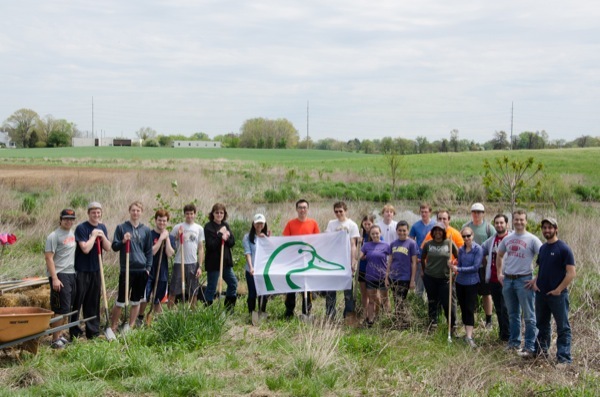 When Mike Popovich needed help to restore wetland habitat located near the apiary in the center of the University of Delaware’s Newark farm, he found it in the form of the Ducks Unlimited registered student organization and also through trees and shrubs donated from the UD exhibit at the Philadelphia Flower Show. The plants from the flower show were donated by Jules Bruck, associate professor in the Department of Plant and Soil Sciences, who serves as one of the professors for the design process practicum class that created the flower show exhibit. Bruck said that one of the aims of the Philadelphia Flower show project is to make the entire exhibit more sustainable. “One way to do that is to make sure the plants from the exhibit go to a good home,” said Bruck. “We focused our exhibit this year on native riparian buffer plants. These plants were perfect for the wetland restoration project.” Bruck added that the Design and Articulture Club sold many of the perennials to the public during the College of Agriculture and Natural Resources’ annual Ag Day celebration. The plants the group donated included the woody plants such as Amelanchier (shadblow), Quercus alba(white oak), Cercis canadensis (redbud), Liriodendron tulipifera (tulip poplar), Salix nigra (black willow) and Alnus serrulata (hazel alder). Chris Williams, associate professor in the Department of Entomology and Wildlife Ecology and adviser for the Ducks Unlimited student chapter, said that it was great to have the DU students learn about restoration because 85 cents of every dollar raised by the organization goes directly to wetland conservation. “These students are getting opportunities to learn about wetlands and have a hands-on education and service experience, so this fit in perfectly with that goal,” Williams said. Working on the wetland An estimated 25 students joined Williams, Popovich, who is a research associate in the Department of Plant and Soil Sciences, and Scott Hopkins, the UD farm superintendent, and spent the afternoon trying to accomplish two main goals — remove invasive species from the wetland while at the same time lowering the water level. Cattails are one of the major invasive species in the wetland and Williams said the group spent the better part of the afternoon clearing out the plants. “The place was just filled with cattails and so half of us were in there with waders, slowly pulling out all these cattails,” Williams said. “I haven’t gone down in the past couple of weeks but I wouldn’t be surprised if some of them had grown back since we pulled them, but it seemed to have held nicely.” Concurrently to the cattail removal, the other half of the group planted trees and shrubs one would expect to find in that type of environment in northern Delaware. “We planted a lot and everything was native,” said Popovich. “Many of the plantings were in specific areas and were bank stabilization type plants — dogwoods and viburnums — and it was all using live stakes, which makes it easier as we just punch them into the ground.” For the most part, the invasive species are now in check thanks in part to the planting of reed canary grass, which Popovich said is a hardy competitor in the landscape. “The wetland was an old pasture and in a pasture, you’re managing weeds all the time,” Popovich said. “When you turn it into a wetland, you’re not going to be able to spray all the time so those weeds are going to love it, and reed canary grass is one of the few things that will out-compete that stuff.” Dropping water level In addition to the invasive species removal, the other goal was to lower the wetland’s water level. Popovich said that typically with wetlands, the water level drops in the spring and boards are pulled on a weir — a barrier designed to alter flow — to allow water to run through. With the wetland on the farm, however, it’s a different story. “Our wetland is more of a nutrient and sediment control site than anything else. We need it to control any runoff from our fields. You get runoff into the wetland and you slow it down so it’s not going into the White Clay. Our goal is to make the water at the end of the system clear, so to speak,” said Popovich. With the weather Newark experienced this spring, Popovich said it was a challenge to reduce the water level, which hindered his ability to plant millet, a small-seeded grass that would have attracted ducks to the wetland in the fall – a time when it is ideal to have food for the birds as they head south for the winter. “Normally after Memorial Day it just dries right out and that would’ve been perfect,” Popovich said. “We would’ve been able to drop levels down, plant the millet and then put the weirs back in and flood it in the fall, and there would be all that food right there for the ducks. But this spring, we had about seven inches of rain one weekend. If I had had those boards down, it would’ve been a muddy mess, just running right down, so I elected to leave it up to control the water.” Williams said that typically state and federal wetland impoundments will promote winter waterfowl food by dropping water levels down in summer, planting food of different types, letting it come to seed and then re-flooding the area. This is done “so when ducks migrate in the fall, they will have both water resources and extra seed food supplies in addition to the baseline availability of invertebrates and seeds,” Williams said. “It’s kind of a ‘best of both worlds.’ Not a lot of ducks breed in Delaware during the summer months, so reducing these wetlands temporarily will not adversely hurt the populations. But it can be a huge gain in the winter when the Mid-Atlantic hosts large numbers of the East Coast’s waterfowl.” Popovich said that now in the fifth year of planting, he sees a lot of progress with regards to the wetland as he has experienced “better than a 60-70 percent success rate so far, and that’s just using all native plants.” Article by Adam Thomas Photos by Danielle Quigley This article can also be viewed on UDaily.